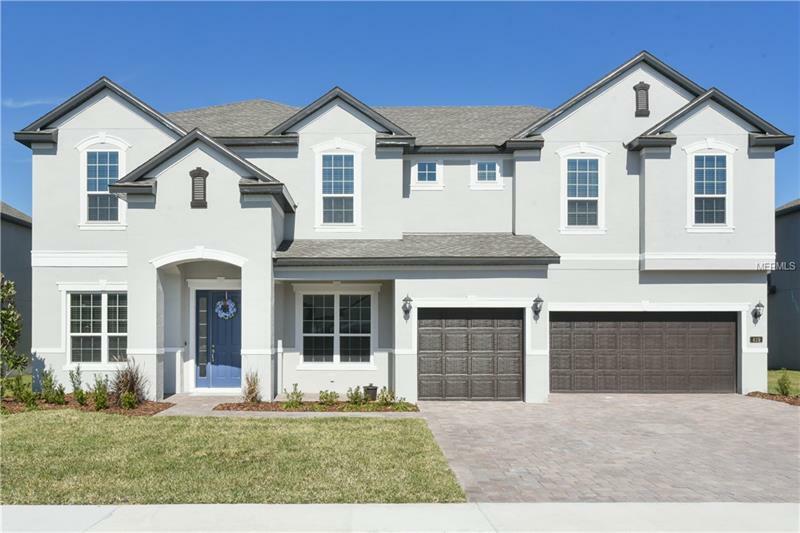 Act quickly on this 2018 built Kerrville II floor plan by Meritage homes in quaint Oviedo community of Hammock Park. This 4278 square foot 6 bedroom 4 bath home has over $75000 worth of upgrades and is move in ready! Large foyer and open floorplan with 6x24 plank Tile floors throughout main downstairs living areas give this house a modern feel. Downstairs find an offfice with double doors for privacy and a formal dining room for entertainment. A state of the art gourmet kitchen includes Cherry Slate cabinets QUARTZ counters Kitchenaid STAINLESS STEEL appliances with double oven and incredible center ISLAND with tons of prep space and breakfast bar for 6. The kitchen is open to the breakfast nook and the family room. Sliders doors open to the expanded covered lanai and spacious backyard. Secondary master bedroom with walk in closet and a pool bath complete the downstairs space. Room for everyone upstairs with 4 additional bedrooms master bedroom and a 23âX16â GAME ROOM. The 3 way split floorplan spreads everyone out but allows for the game room to be the central gathering area. The gorgeous MASTER SUITE has an owners bath with GARDEN TUB shower with semi-frameless shower enclosure quartz counters with double vanity and a spacious walk in closet with natural light. Other amenities include 3 car garage large mud room with loads of cabinet space upstairs laundry security system and ALL bedrooms have walk in closets. All of this and close to Oviedo on the Park Cross Seminole Trail and SR 417.